Are you a construction worker injured in a ladder accident in Queens? 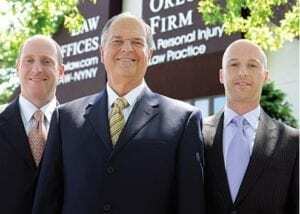 At The Orlow Firm, you will work with experienced Queens construction accident attorneys who truly care for our clients. We have helped thousands of clients obtain the compensation they need after serious injuries, and we understand that a fall, even one that seems like an accident, may actually be the fault of your employer, a manufacturer or another employee. If you have been injured or lost a loved one in a construction accident, let Queens construction accident attorneys at The Orlow Firm show you how we can help. You will work with a named partner at our firm, and we believe you should expect nothing less. Our cases are handled on a contingent fee basis, which means that we are paid only if we obtain money damages in your case.